We arrived in SG around 2PM on Sunday. We plan a dinner of burgers but after having a late lunch decide that we are too full to eat dinner. We have an English muffin with peanut butter instead. On Monday we get a text from our daughter. It has rained very hard and the roof is leaking big time. Shortly after lunch we get in the car and start the trip back to California. We stop again in Barstow. We eat again at Chili’s. 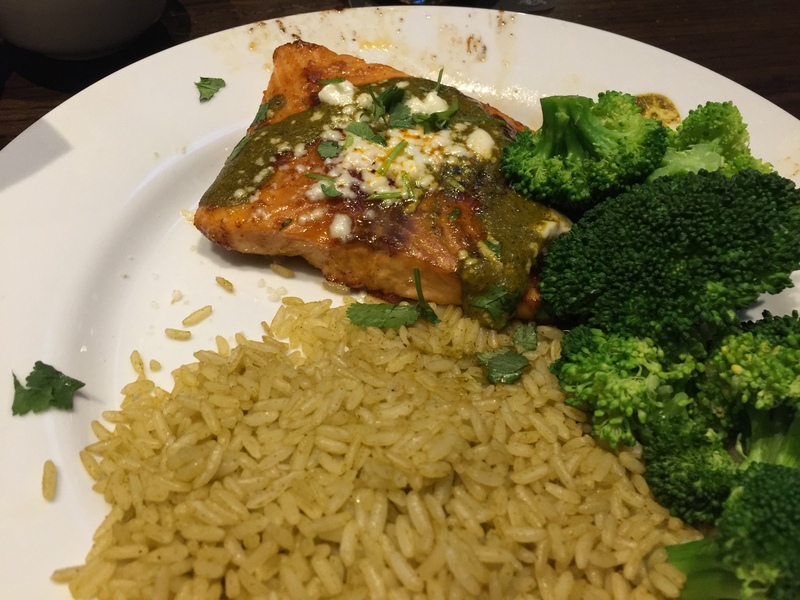 I get the ancho salmon off their “light an healthy” menu. It’s pretty good but it seems like it should count for more than 590 calories. I give some to John. The plating was pretty messy. After forgetting to turn my clock back to Pacific time, I set the alarm for 5:30 AM and we get up at 4:30 AM. After a quick cup of coffee we are in the car again and arrive home around noon on Tuesday. We are exhausted. We have driven around 1400 miles in the last four days. We are too old for this. This entry was posted in Dining out, Fish, pescatarian, rice, Vegetables and tagged broccoli, Dining out, rice, salmon. Bookmark the permalink.